UPDATE: Separate pages for decoding 1970-1976 VIN's and data plates have been added for Ford. Just look under the appropriate Ford Torino Page for the year you have. 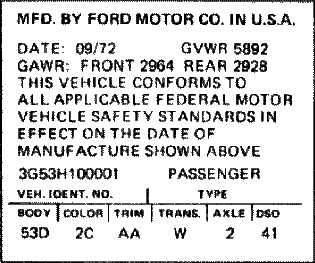 Below is a description of the VIN number (located at the bottom left of the front windshield) and the Data Plate (which is located in the driver side door jamb). Much of the cars information of how it was delivered and with what basic options/colors it was delivered with. To translate the numbers and codes into actual information, please go to the applicable MODELS section for your car. The information will be in the "options" tab or the "standard features" tab. First, here is the VIN number and what the numbers mean. Now here is an example of the Data Plate found on the driver side door jamb. This is a typical data plate, although they varied a bit from year to year (71 and prior are a bit more different). Below is an exploded view of the lower portion of the data plate where most of the color and power train information is. As stated above, please go to the applicable MODELS section to decode the actual numbers and codes for your car. This page was last edited on 26 July 2007.